Byrd is one of the very few cultivars with a large size nut and very early harvest date, usually ripening in mid-late September, about a week after Pawnee. Byrd is superior to Pawnee because it has better kernel color, no flecking of kernel, and a higher percentage kernel. It also appears to have an advantage over Pawnee in that it is less scab susceptible. However, this is a new cultivar and scab may become an issue in the future. Growers should plant this cultivar with the thought that it will require full season fungicide protection to control scab. Byrd is a precocious variety that will need fruit thinning as the tree matures, and it is well-suited to mechanical thinning. Byrd trees have a large cluster size and load up with nuts that are slightly larger or similar to Cape Fear. This will be a recipe for strong alternation if crop load is not managed by shaking them off in the summer. Nut size and quality have been very good. Shell thickness is very thin and kernels are well developed, leading to a high percent kernel. Production was about 2.7 times greater than Cape Fear during the fifth year after planting and about five times greater during the sixth year. 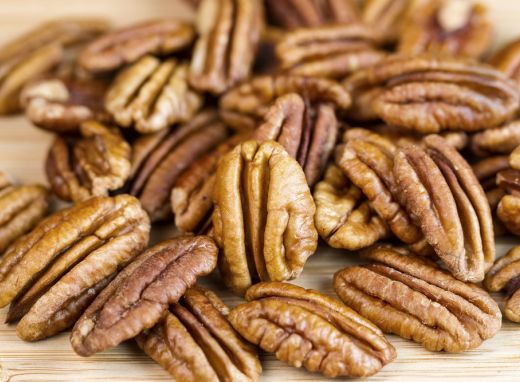 Percentage kernel is 60.7%, exceptionally good for pecans and higher than Cape Fear (51.6%). Because of Byrd’s early nut maturity, it should not be planted with late-maturing cultivars such as Stuart. It can be used in gardens or for commercial production. Nut size slightly larger or similar to Cape Fear.